Intermediate Raptor Handling Class /Hawks Aloft Inc.
On March 3, a small group of Hawks Aloft staff and volunteers gathered for a second time to acquire greater skill and comfort when it comes to working with our team of more than 20 permanently injured birds of prey. Raptor handling classes are a unique and important part of working at Hawks Aloft and provide an interesting way to interface with the bird species that are at the core of our mission. 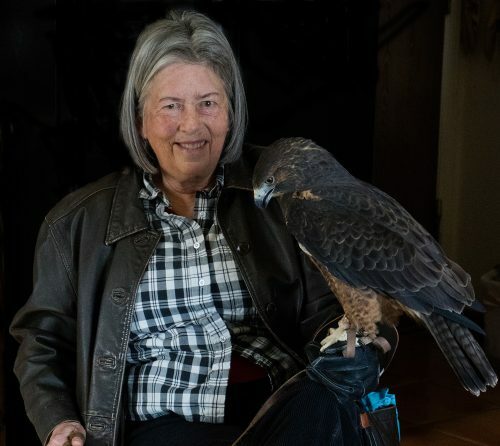 On this particular occasion, volunteers Mary and Brigitte, Raptor Rescue Dispatcher Jeannine, and I, sat down at Executive Director Gail’s house in Rio Rancho, eagerly awaiting a lesson from Gail and Education Coordinator and raptor handling aficionado Julia Davis on how to safely and comfortably work with our larger Avian Ambassadors. 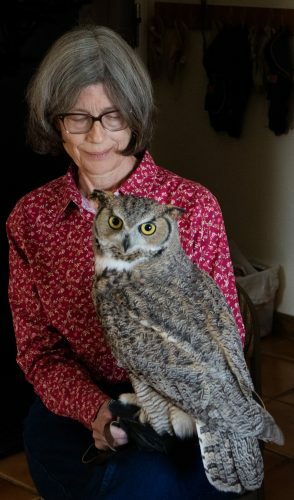 For this lesson, we were joined by Celeste, a Barn Owl, Aztec, a Great Horned Owl, and Idaho, a Swainson’s Hawk who came to us last year with feather damage. 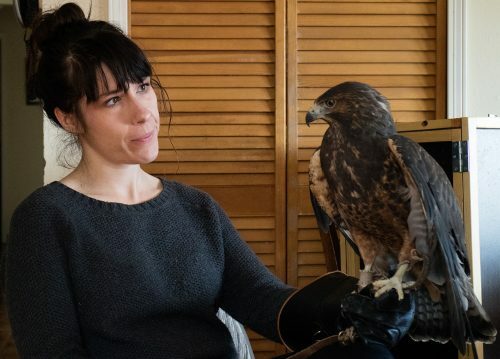 Each of these birds requires specific knowledge in order to keep them relaxed and happy on the glove, which was a key a point in this intermediate raptor handling class. Julia and Gail strongly emphasized the need to be familiar with each bird’s distinct needs. Do they have trouble balancing on the glove? Do they jump for the box when it is time for them to be put away, or, alternatively, do they tend to jump out of the box as soon as you swing open the doors? Do they tend to bate, and if so, do they require special attention to get resituated? This detailed knowledge of each particular bird’s personality and needs was strongly emphasized in this class series so far. 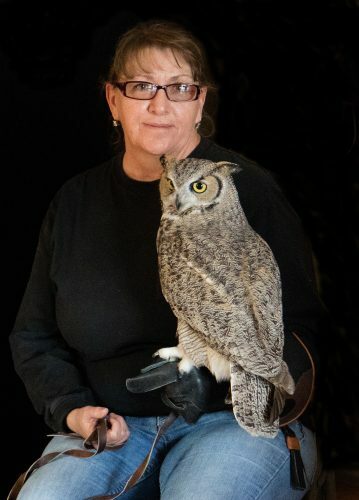 Secondarily, with more advanced handling skills, more advanced knowledge of each bird’s species as a whole makes for broader insights into who each bird is, and allows the handler to better answer questions and confidently work with the bird while simultaneously delivering programming at events in the future. As such, another key component to these intermediate handling classes was discussing and sharing knowledge about each bird species. We all took turns explaining the range of each species, their behavior and habitat, as well as sharing some facts that make each unique. Taken as a whole, the classes have provided great insight not just into how best to work with birds on the glove, but into the a variety of raptor species, as such, these expansive classes have been worthwhile for all involved.